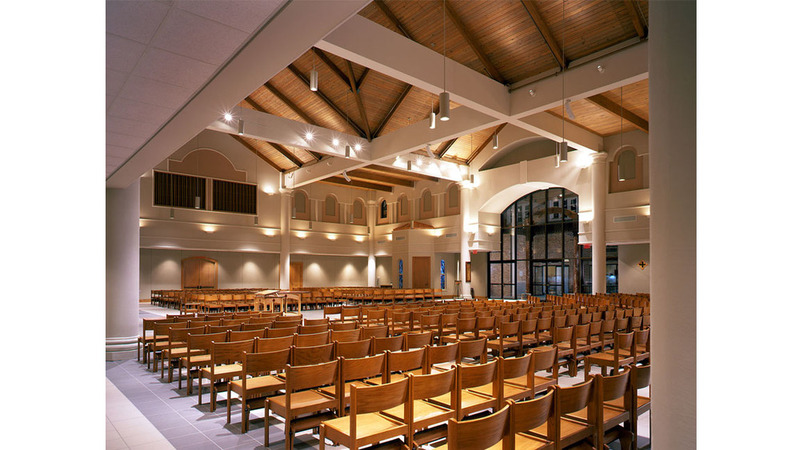 POST ARCHITECTS developed the LSU Catholic Church and Student Center Master Plan to incorporate a larger worship space, new classroom and administrative facilities, and more parking. The architects overcame a very constrained site bound by the existing Church and live oak trees. The existing church was maintained on the prominent corner and renovated into a Student Activity and Meeting Center. The existing administrative/classroom building was replaced by the new sanctuary. The old and new structures are connected by a gathering space which serves as the facility's entrance at each end. The new Administrative/Classroom Building and new parking area were located at the rear of the property.